Units 1, 2, and 3 reactors appear to in a stable condition with seawater injection continuing. 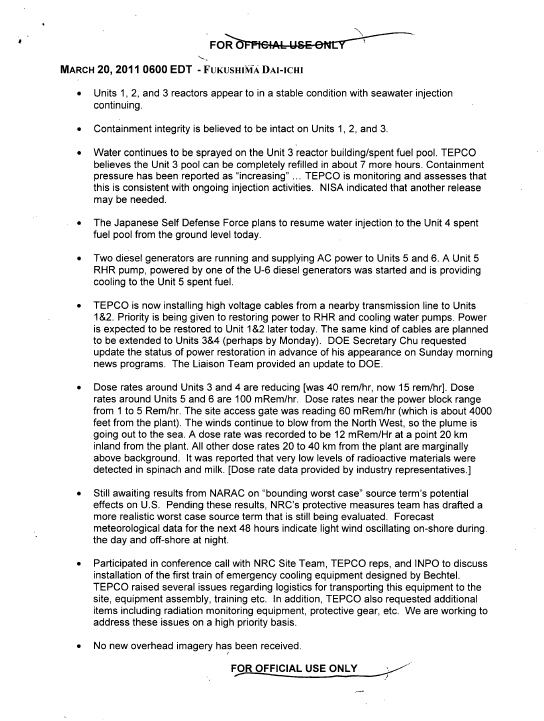 Containment integrity is believed to be intact on Units 1, 2, and 3. Water continues to be sprayed on the Unit 3 reactor building/spent fuel pool. TEPCO believes the Unit 3 pool can be completely refilled in about 7 more hours. Containment pressure has been reported as “increasing” … TEPCO is monitoring and assesses that this is consistent with ongoing injection activities. NISA indicated that another release may be needed. The Japanese Self Defense Force plans to resume water injection to the Unit 4 spent fuel pool from the ground level today. Two diesel generators are running and supplying AC power to Units 5 and 6. A Unit 5 RHR pump, powered by one of the U-6 diesel generators was started and is providing cooling to the Unit 5 spent fuel. TEPCO is now installing high voltage cables from a nearby transmission line to Units 1&2. Priority is being given to restoring power to RHR and cooling water pumps. Power is expected to be restored to Unit 1 &2 later today. The same kind of cables are planned to be extended to Units 3&4 (perhaps by Monday). DOE Secretary Chu requested update the status of power restoration in advance of his appearance on Sunday morning news programs. The Liaison Team provided an update to DOE. Dose rates around Units 3 and 4 are reducing [was 40 rem/hr, now 15 rem/hr]. Dose rates around Units 5 and 6 are 100 mRem/hr. Dose rates near the power block range from 1 to 5 Rem/hr. The site access gate was reading 60 mRem/hr (which is about 4000 feet from the plant). The winds continue to blow from the North West, so the plume is going out to the sea. A dose rate was recorded to be 12 mRem/Hr at a point 20 km inland from the plant. All other dose rates 20 to 40 km from the plant are marginally above background. Still awaiting results from NARAC on “bounding worst case” source term’s potential effects on U.S. Pending these results, NRC’s protective measures team has drafted a more realistic worst case source term that is still being evaluated. Forecast meteorological data for the next 48 hours indicate light wind oscillating on-shore during. the day and off-shore at night. Participated in conference call with NRC Site Team, TEPCO reps, and INPO to discuss installation of the first train of emergency cooling equipment designed by Bechtel. TEPCO raised several issues regarding logistics for transporting this equipment to the site, equipment assembly, training etc. 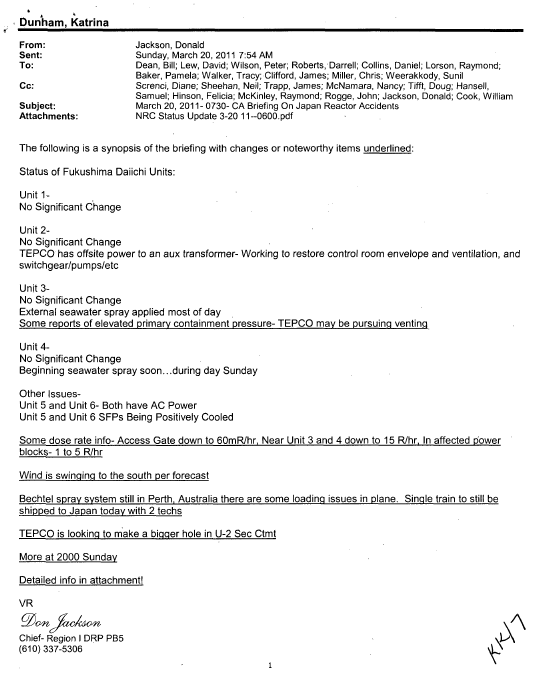 In addition, TEPCO also requested additional items including radiation monitoring equipment, protective gear, etc. We are working to address these issues on a high priority basis. No new overhead imagery has been received.